2 weeks after the arrival, I am feeling balanced again. This has a lot do with the fact that I started teaching again. I think I am a workacholic. I don’t feel good when I am on vacation. (Well, maybe, maybe not. Why come to conclusions about ourselves?) What I know for this phase in my life time is I love teaching and it is only when I am teaching I feel at home. After two weeks of sleeping in (until way past my wake-up time. blame it on the jetlag), last Monday I got up at my usual 5:30am. By the time I arrived to the studio, the morning prayer from the mosque started. Five times a day we have ezan, the Arabic chanting from the loud speakers that invites people to pray. In the darkest time of the day, the only quiet time of this ever beating city, I started my practice. The studio I work in Istanbul (Cihangir Yoga) is on the 5th floor of a building by the sea. As my students walked in, I saw the sky changing from black to purple and then to deep pink. I watched the sky waking the sea up from its dark sleep and listened to the seagulls screaming in ecstasy to salute the sea. I don’t remember seeing any other city in the world that is more beautiful than Istanbul. I am not saying this because Istanbul is where I am from. Most of you know that I have a long list of complaints and reasons of why I don’t want to live here. 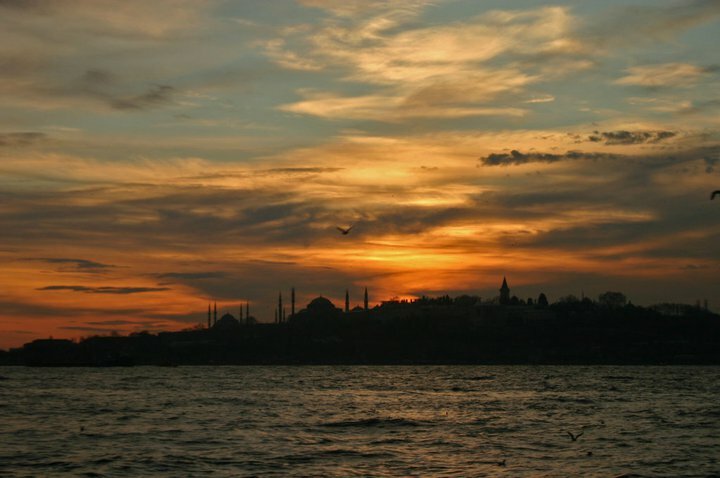 Yet still, as the day breaks over Bosphorus, I remembered such a breath taking beauty this city was! During the class hearing my voice in Turkish felt a bit strange at the beginning. My mind is still operating in English language. But while teaching something else took over and spoke all the words in Turkish for me. That was the strange part. Who is speaking as we teach? The weather is like lemonade as we say in Turkish. Sunny, crispy, no winds, no down jackets. Plus my soul finally arrived! Now that I have my soul with me, it is time to enjoy the beauties! I hope you are all doing great whereever you are. Know that you are missed! Thanks for update. Missing you. Sunrise, Sunset, By The Sea, Glory Be. @Rosa's BudsThanks for the comment! Looking forward to look at sunrise together with you and the lady!